NEWPORT, R.I. — In the second round of the Hall of Fame Tennis Championships, two-time defending champion John Isner extended his Newport winning streak to 12 victories today, defeating Adrian Mannarino of France to earn a spot in the quarterfinals. On Friday, he’ll face fellow big server Ivo Karlovic, who defeated Canadian Vasek Pospisil, in three sets. This will be the fourth meeting, and the first on grass courts, between Isner and Karlovic, who are the two tallest players on the ATP World Tour, standing at 6’9 and 6’10 respectively. Karlovic leads the head-to-head 2-1. 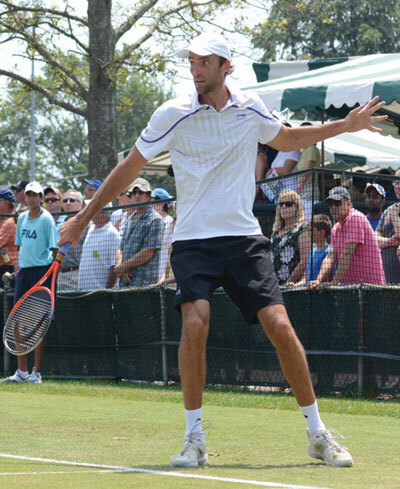 Ivo Karlovic — Photo by Allie Conn.
“This certainly could be a match that can come down to just a point here and there,” said Isner. Newport’s 2012 finalist Lleyton Hewitt also earned a spot in the quarters today, defeating wild card Prakash Amritraj. At 32 years old, Hewitt is one of five players in their 30s to reach the quarters, the most in the 37-year history of the tournament. Newport’s 2007 finalist Nicolas Mahut, who captured his first title on grass last month in ‘s-Hertogenbosch, also advanced with a 6-2, 6-4 win over American Tim Smyczek. Action begins again tomorrow at 11 a.m. The first match on Center Court will see the Australian pairing of Chris Guccione and Lleyton Hewitt taking on Brazilians Marcelo Demoliner and Andre Sa for the last spot in the doubles quarterfinals. The singles quarterfinals then begin with No. 3 seed Igor Sijsling of The Netherlands taking on American Michael Russell. Both advanced today with 6-3, 6-4 wins, respectively defeating Japan’s Yuichi Sugita and American qualifier Alex Kuznetsov. Next up, Maut will take on Michal Przysiezny of Poland. Center Court action wraps up with an all American doubles showdown between Denis Kudla and Michael Russell taking on Tim Smyczek and Rhyne Williams.